Gwalior, Nov 18: The Haryana Governor Kaptan Singh Solanki on Saturday conferred ITM University’s honorary D. Litt. 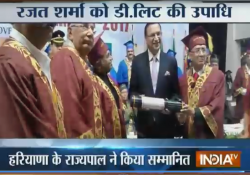 degree on India TV chairman and editor-in-chief Rajat Sharma at a convocation ceremony. Addressing students and professors of the university, Rajat Sharma stressed on the need to strive hard to achieve goals in life. Governor Solanki lauded Rajat Sharma’s achievements and exhorted students to follow his ideals.